Thanks to Nimbus Publishing for sponsoring this post so that I can help you raise little readers who love local books. As always, all opinions are my own. Please see my Disclosures for more information. This month's pick for our Itsy Bitsy Nimbus Book Club is literally a work of art by Haligonian Angela K. Doak. She's created a gorgeous board book called Atlantic Animal ABC that not only teaches little ones the alphabet and about Atlantic critters, but it also introduces them to collage. Our first activity taught children how to match the alphabet letters and animals in the book, and this activity shows them how to create their own images using the same medium as the illustrator. Doak uses all sorts of found materials for her collage work - from junk mail and scraps of fabric, to candy and gum wrappers! This art activity will teach chlidren how to create their own Atlantic Animal collage art. Start by creating some shapes for the children to use. Trace the images in the book or recreate them freehand onto the card stock, then cut them out. Show the children the images in the book and explain how they were created using various bits of materials and introduce them to your supply. I used an old veggie dip container but you can just lay them out on a table or in individual containers. Allow the children to cut and glue as they are inspired to. Miss M snipped a couple little triangles and then realized if she put them together they looked like a crown...and she began making a Princess Trout, complete with a diamond and sparkles, courtesy of Easter egg foil wrappers (I had to eat a few extra from the hidden stash so we had enough. All in the name of art, my friends). A big part of this is giving them creative license to make it look however they want. I left the book nearby and they often referred to it - either just to flip through, or to imitate something on it (such as where the eye goes on the trout). My children ended up grabbing a few markets to add some embellishments they felt they couldn't do with the materials. A further extension of this might be to create a mural with different landscapes using collage materials (rivers, forests, oceans) and have the children add their creations to the mural. You can see our full list of book extension activities here and you can purchase a copy of this book at local retailers such as Nimbus Publishing, Nurtured Products for Parenting, Bookmark II, Woozles, Chapters and Amazon (affiliate link). 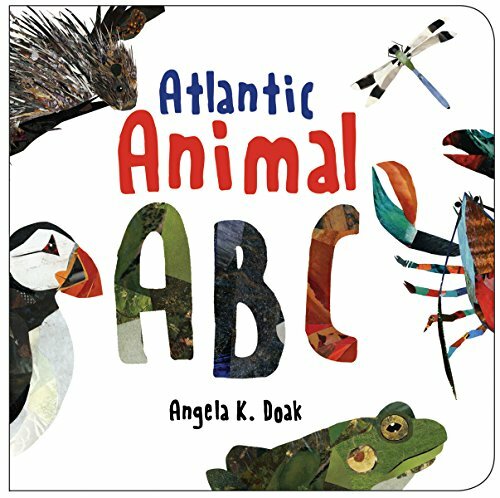 You can also enter to win a copy of Atlantic Animal ABC provided by Nimbus Publishing AND a 5x7 print of your favourite Atlantic animal artwork by Angela Doak, who created the images in the book. Enter by hopping over to our Facebook page and following the directions to get your name in the virtual hat! Contest ends May 23, 2017 and 8 p.m. AST and winner will be chosen by a random draw. Winners must live in North America and be the age of majority in their province.